In my original Toxic Avenger review, I said that if any other Troma films were as tastelessly great as the Real McCoy, you would see a lot more reviews for films from that studio soon. 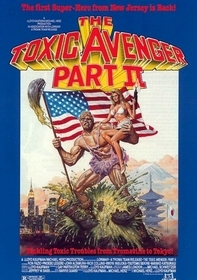 Well, here we are, and unfortunately, I can't say that The Toxic Avenger, Part II quite lives up to the heights of depravity set be its predecessor. It's cheesy, it's fun, and though later viewings may change this, it does not yet qualify for the honored standing of cheesygoodfun (yes, it's all one word). Most of the time, I groan when a horror sequel tries to "outdo" the first film by upping the amounts of blood and violence. Here, where the only reason to watch is the gross acts of maiming, butchering, and mutilation, Troma actually took a step back, and made Toxie more of a slapstick comedy than a gore-hero movie. Many of the baser elements that made TA1 so much fun are reduced, with silly pratfalls in their place. Troma comes through, though, with another in a line of great pointless plots. The beginning of the film finds the Toxic Avenger in the throes of depression. He has long ago thrown evil out Tromaville, and now is idle, unable to do much superheroing or general protection of humankind. Apocalypse, Inc. wants to turn Toxie's hometown into a giant chemical dumping ground. In order to do this, they have to get the mutated hero out of the way. 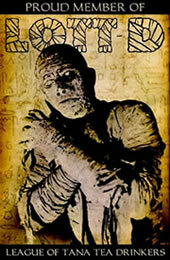 They send him to Japan in search of his father, while they overtake Tromaville. Toxie's trip to the Land of the Rising Sun provides many great jokes about fish, kabuki, and sumo wrestling. Think of every stupid, silly, base, tasteless, horrible, and generally un-PC joke or stereotype that you can. Guess what? They're all in this film somewhere. Midgets, transvestites, lesbians, blind people...all of them get a good dutchrub in the name of a cheap laugh. It's what Troma's all about. The Japanese culture gets a good beating, too. Nobody escapes without scars. The First Law of Troma: Being offensive is not an option. It's mandatory. Two quick notes. First of all, I have to applaud the music department here. The film opens with a crap 80s tune about the title mutant, there's some accordion opera, and "Amazing Grace" plays in the background of the sumo gym scene. Second, no Troma experience is complete without the bevy of trailers before and after each film -- don't skip past them. They're part of the fun. Troma fans should definitely catch this one. Others may want to start out their Troma experience with it, to ease their way into the mire of tasteless crap that makes each movie so great. Toxie, while not in top form here, is still a comic force to be reckoned with, and this should be watched by all with lax principles.